Beginning Friday Tennessee hunters will have their first-ever opportunity to participate in Tennessee’s inaugural August deer hunt that some have referred to as the “velvet buck hunt.” The 3-day season (Aug. 24-26) is open statewide – only for archery hunters and only on private lands for antlered bucks. 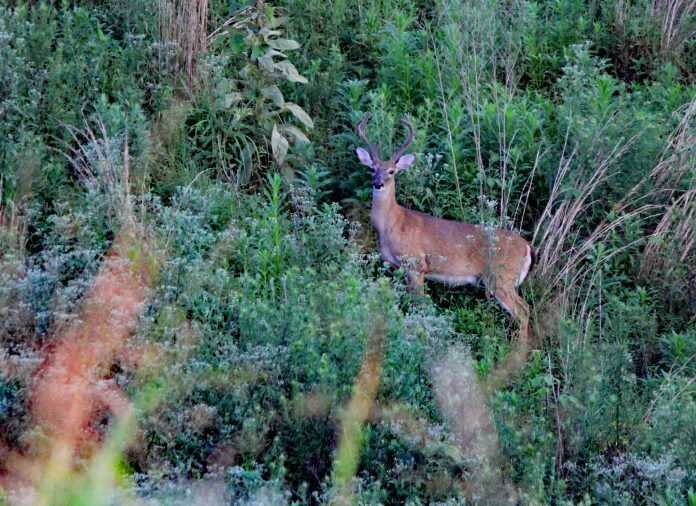 Some deer hunters are excited about the prospect while others are vehemently opposed. At the urging of Wildlife Commissioner Angie Box from Jackson, Tenn., the Tennessee Fish and Wildlife Commission voted at its May meeting to establish this short season to give hunters an opportunity to harvest a buck with velvet-covered antlers. Any buck taken does count against a hunter’s annual bag limit of no more than two bucks. Deer and elk antlers are the fastest-growing animal tissue on earth. Every year in late winter deer and elk lose, or shed their antlers. Over the next six or seven months the animals re-grow potential enormous antlers. During the growth stage the antlers are covered with a “velvet-like skin” which provides the nutrients for the incredibly fast growth. When antler growth stops deer rub their antlers against trees removing the velvet-like covering – usually before regular deer hunting seasons open in late September. Commissioner Box said a group of hunters approached her requesting the early archery season so they would have an opportunity to take bucks still in the antler phase. There was a long discussion of the issue at the May TFWC meeting and TWRA Deer Program Leader James Kelly even asked that commissioners hold off on passing the measure until staff biologists had more time to study the issue. Commissioner Connie King from Clarksville, Tenn. spoke against the measure as well. King expressed concern expressed to her by hunters that in August, “bachelor buck” groups might be too easy to pattern and harvest. In the end wildlife commissioners passed the measure on a voice vote (meaning it is not clear on exactly who supported the measure and who was opposed). On Facebook many hunters seem apathetic about the early season hunt. Others felt strongly that it’s another excellent opportunity for Tennessee hunters. Go here for more information on Tennessee’s deer hunting regulations.